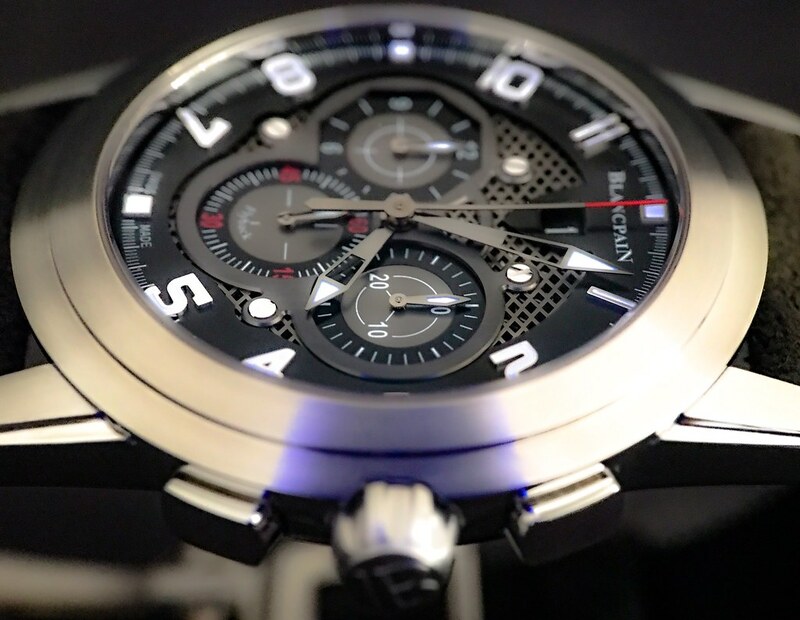 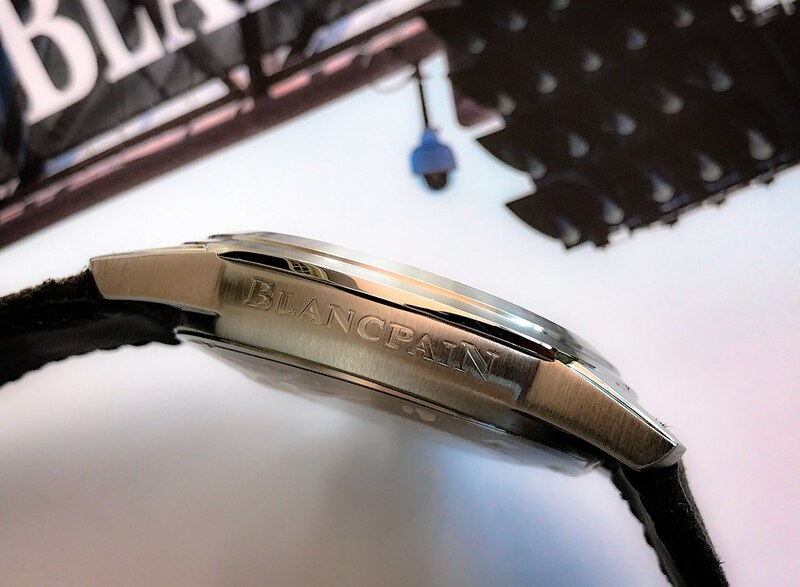 Alongside the 24h of Spa Franchorchamps Blancpain not only had the Basel novelties on display, but also numerous timepieces that carry a motorsport inspired design, predominantly in the L'Evolution series. 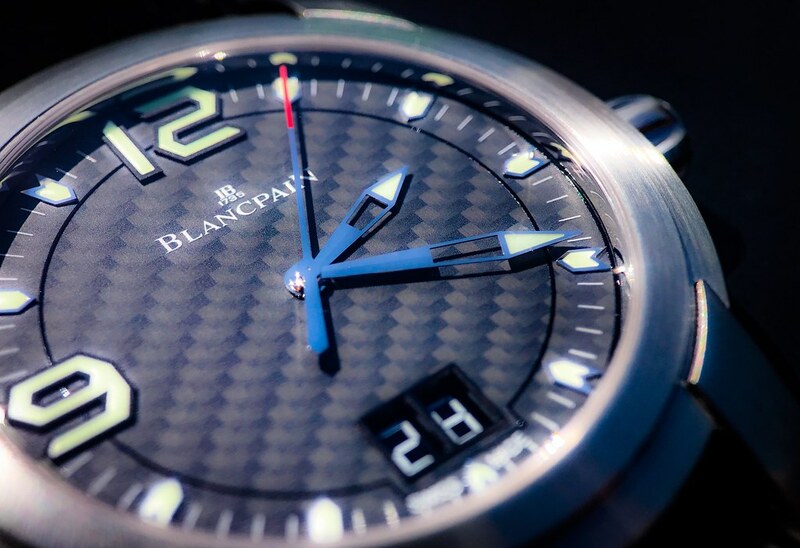 Two of those I had the pleasure to take photos of, thanks to the Blancpain Boutique in Munich. 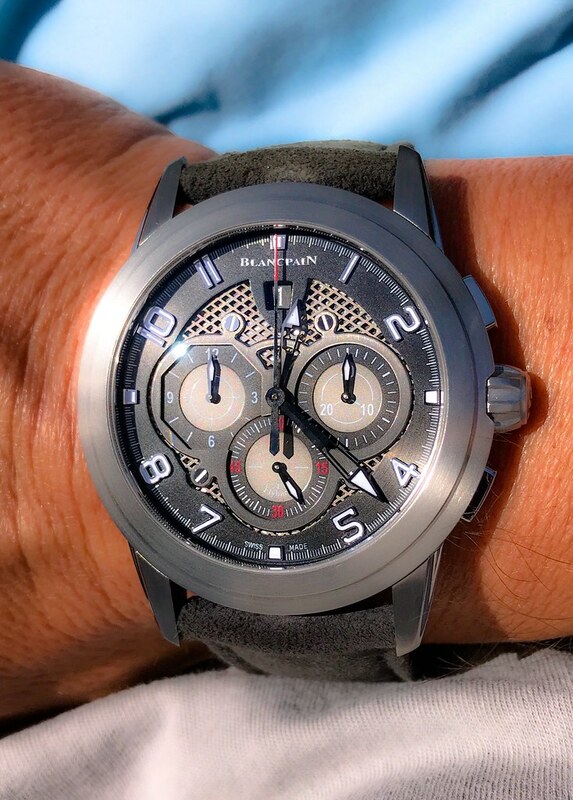 Before we get closer to those two watches let me share some general thoughts on the L'Evolution from my personal perspective. 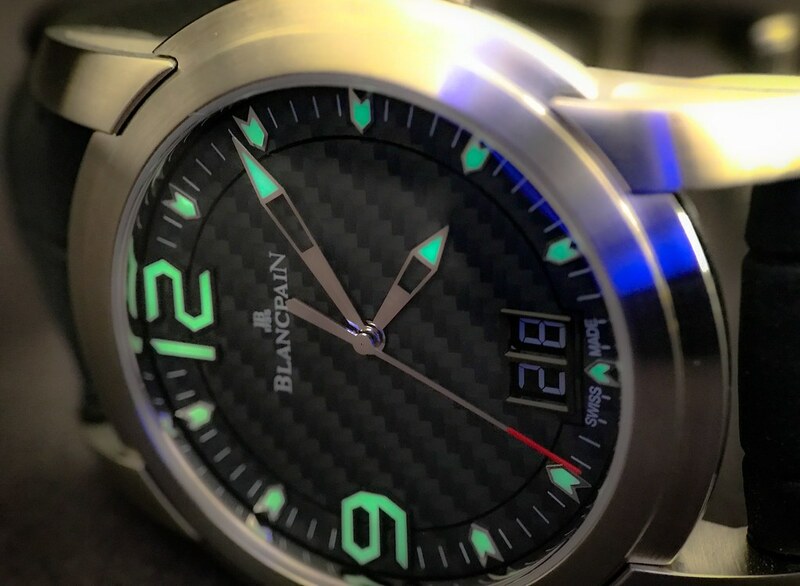 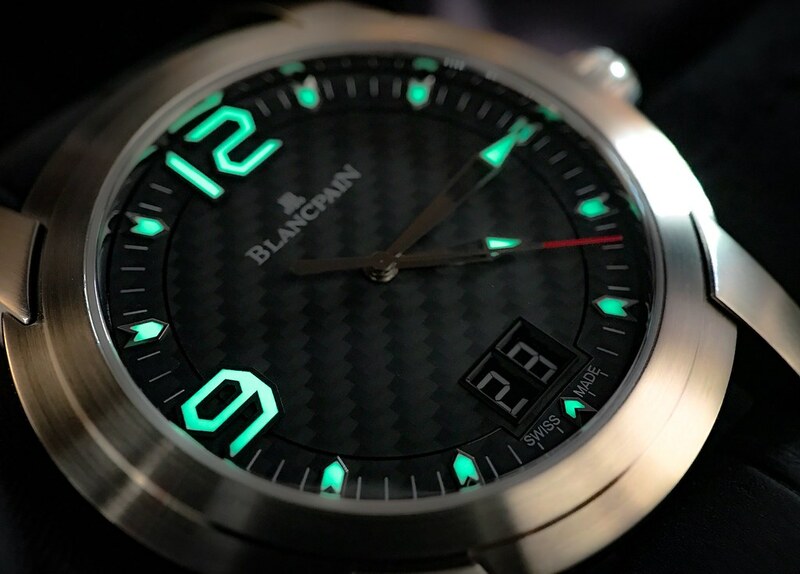 As the name suggests, the idea behind the line was to find a new concept for the Leman series, designed fully from scratch and allowing for creativity beyond the traditional Blancpain aesthetics. 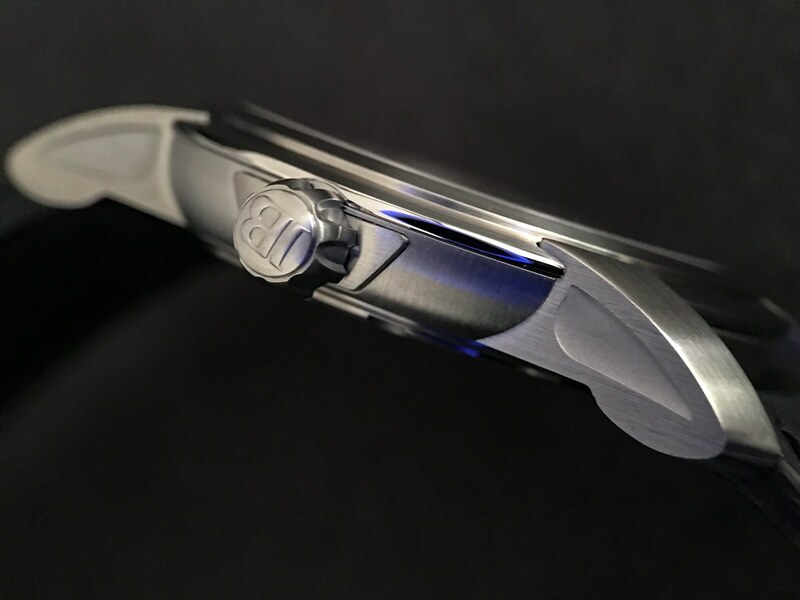 The L'Evolution series used two different case designs from the very beginning, both of those are featured in this report. 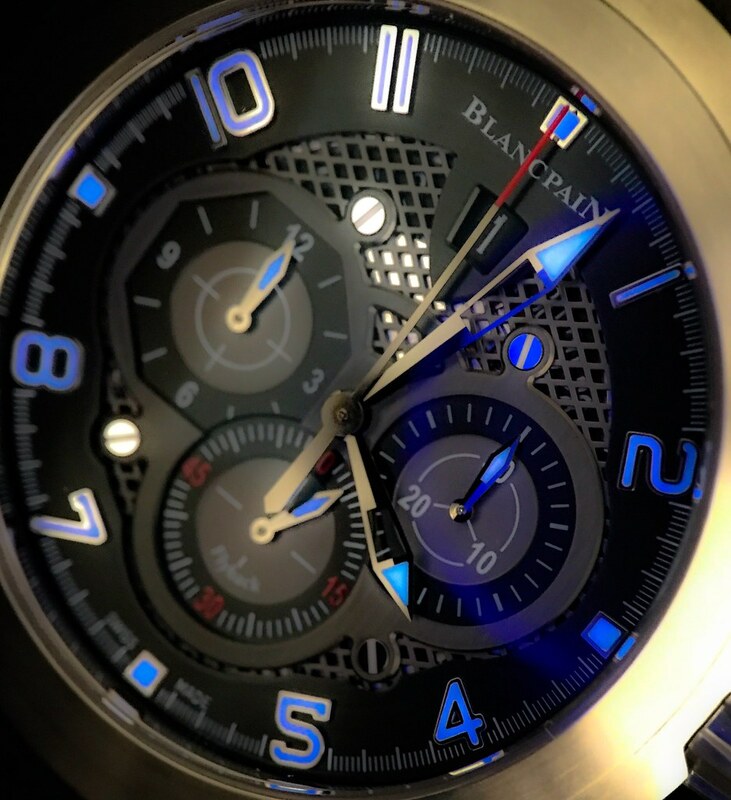 It also used two different design concepts, one of them aiming to interpret existing timepieces in a new way, the other being inspired by the brand's engagement in motorsports and for several years a close link to Lamborghini. 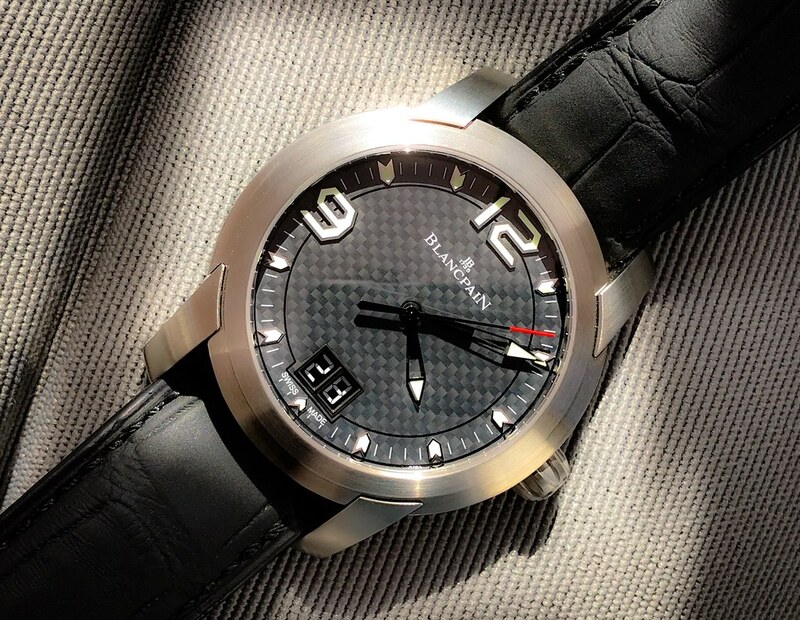 The L'Evolution watches polarized from day one, and this is mainly caused by the dial designs. 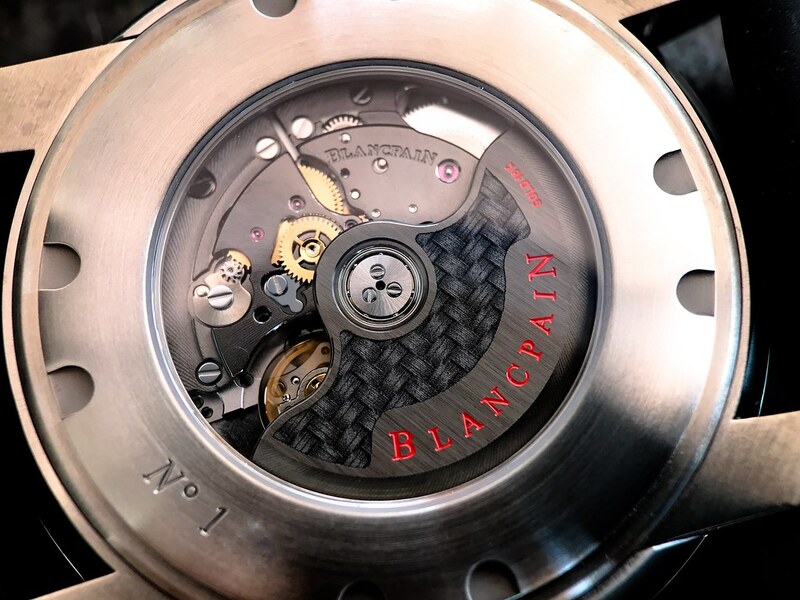 The cases used have been designed extremely well, they stand out on their own, carry new innovative ideas like the removable lugs and are finished at highest standards. 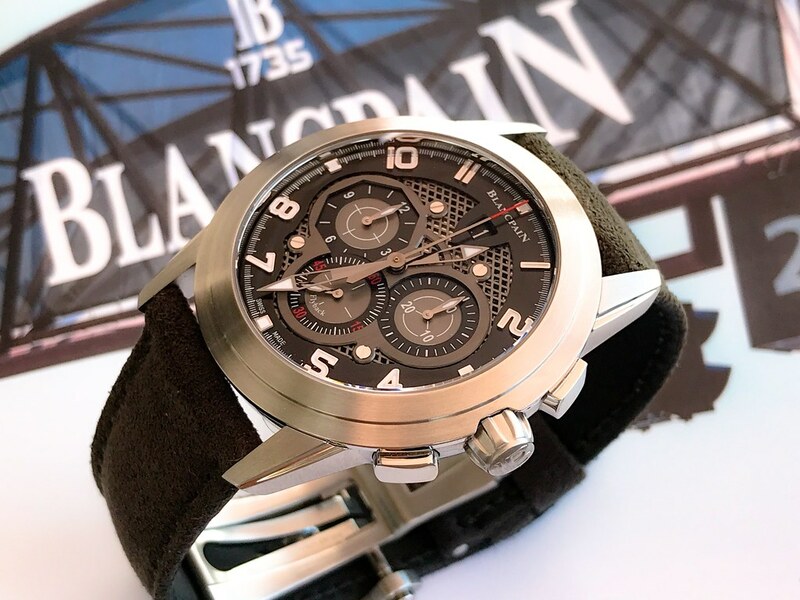 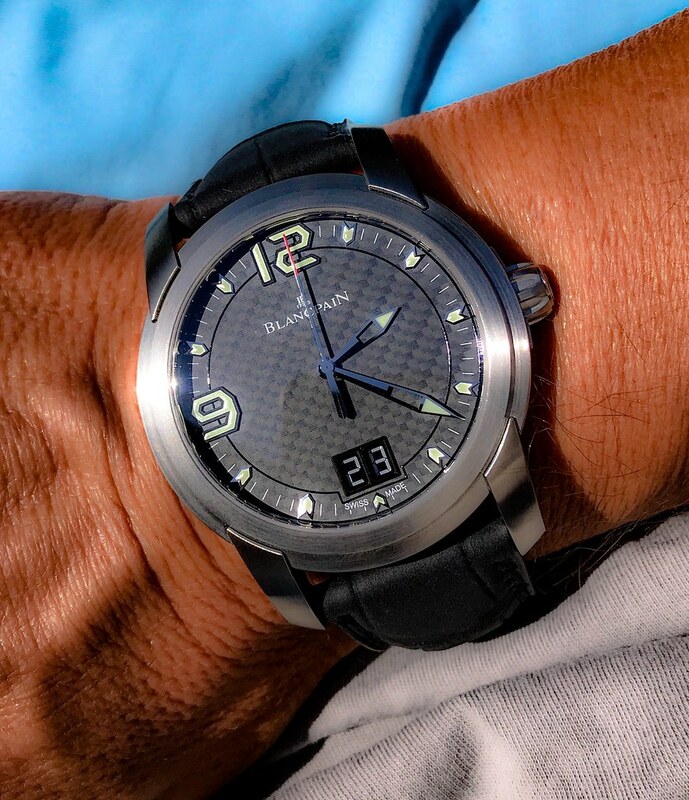 Blancpain developed a series of eight day automatic movements for the L'Evolution, some of those found addional homes in the Villeret line as well. 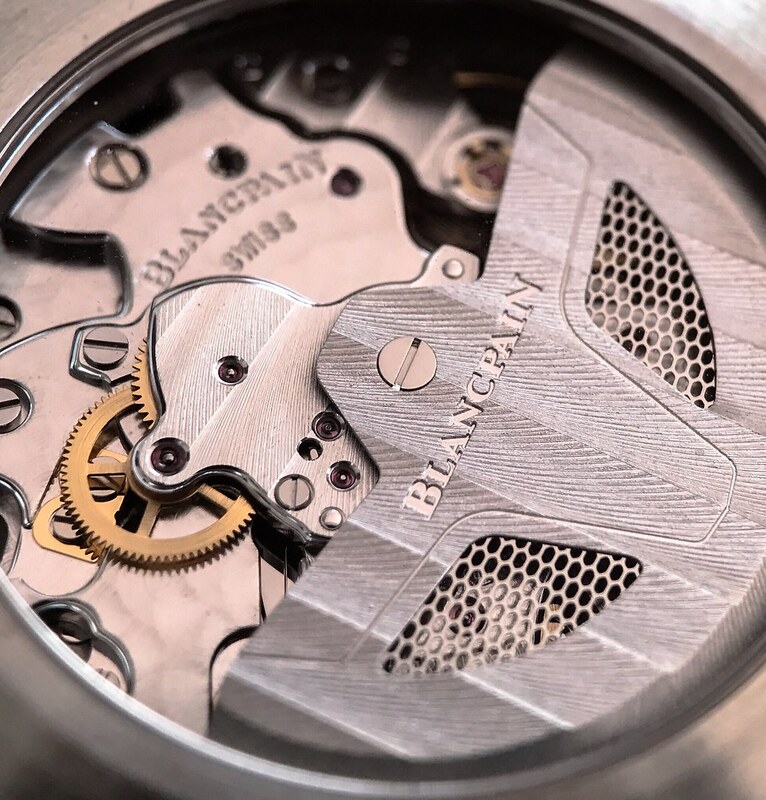 The dials may have distracted from the beautiful case designs and movements, and understandably so since a dial is the face of the watch. 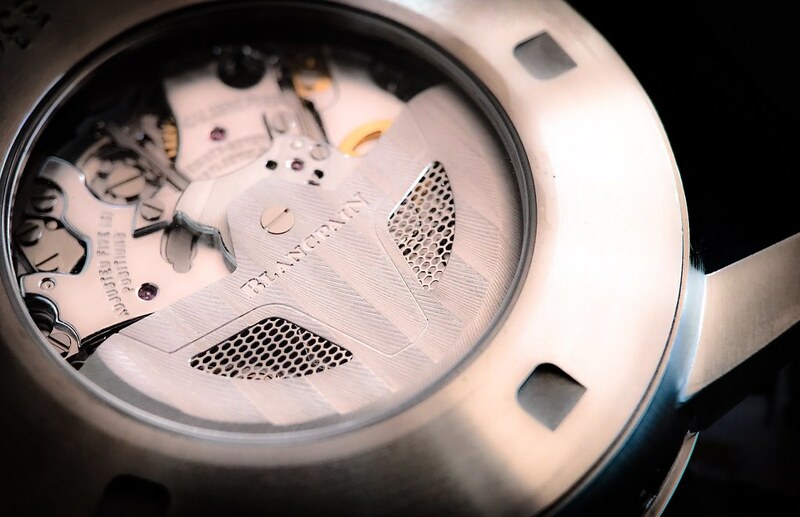 The polarized take on the dials may be even more true for the motorsport inspired timepieces, my aim here is to take a close look and offer a view on the many details those watches have. 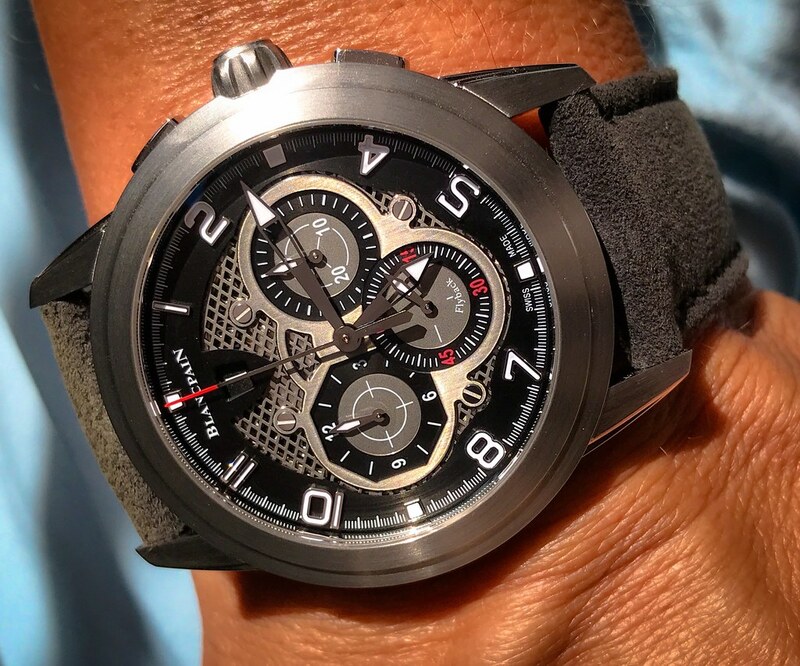 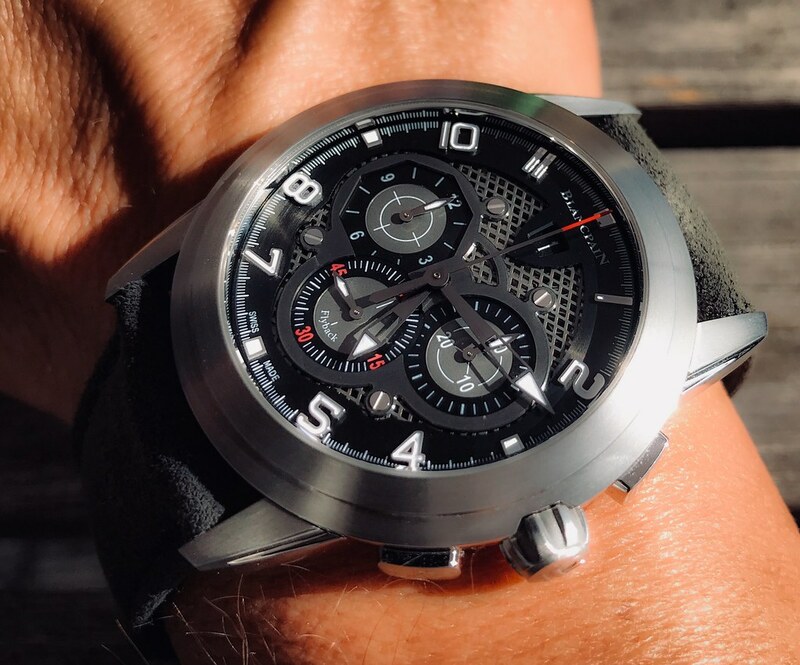 The watch features a 43.5mm brushed stainless steel case with a few polished accents,it comes on a Alcantara strap with deployant buckle and is powered by the well established calibre F185. 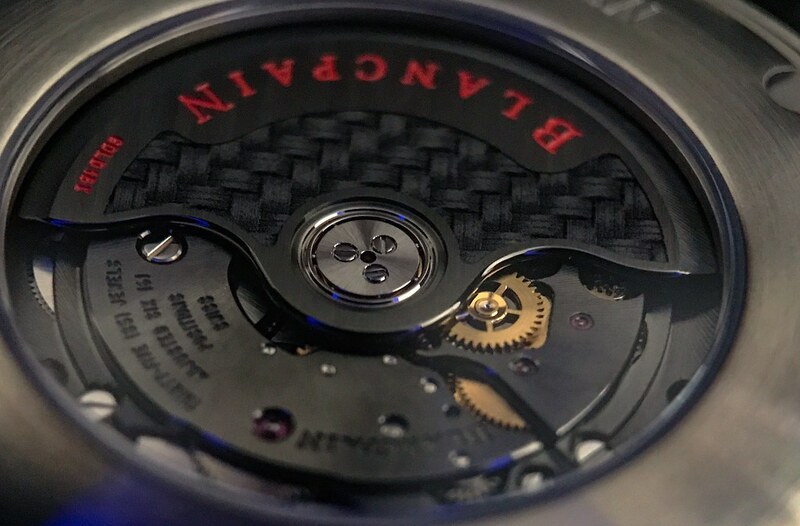 The anthracite dial is skeletonized in a special fashion, but due to large hands and traditional numerals the readability is actually very good. 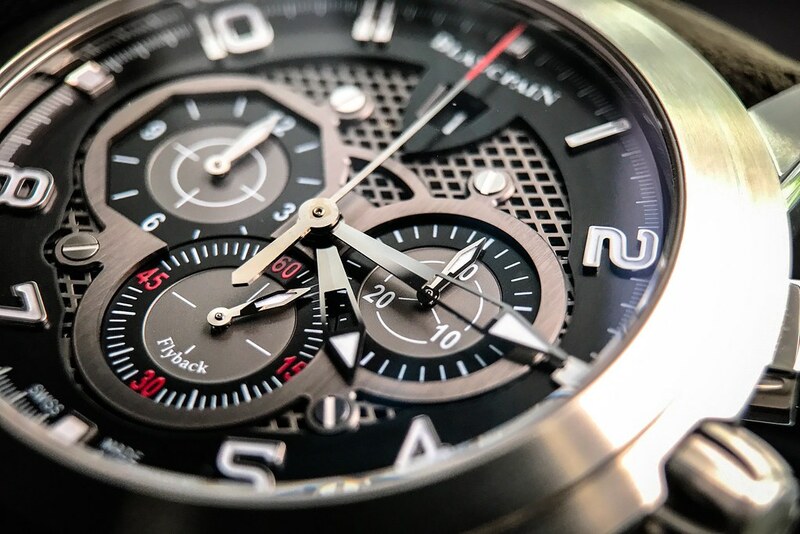 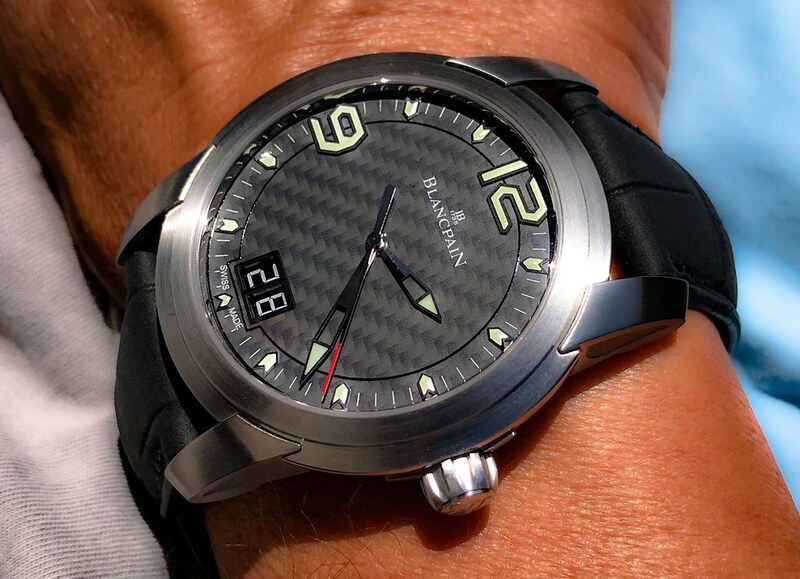 As you see it features a totally different 43.5mm case, executed in brushed stainless steel with removable lugs, it comes on a matte alligator strap with deployant bucke, houses the calibre 6950 (known from the Leman Aqua Lung Grande Date) which comes coated in black and has a carbon fibre dial with two Lamborghini Super Trofeo inspired numerals. 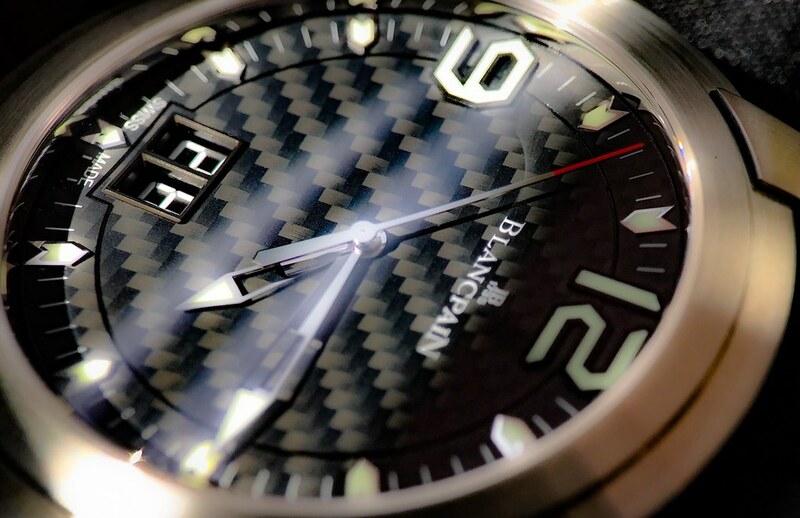 The dial design breaks with the rules of symmetry by not featuring a numeral at the 3 position, the material used has the effect that it appears very different in various light conditions. 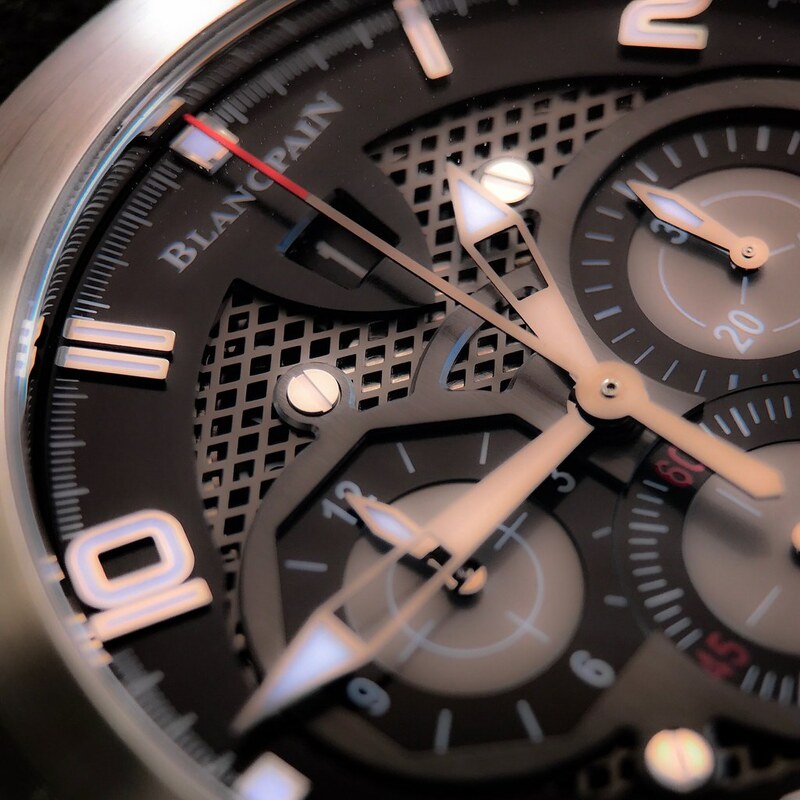 First, both watches are executed extremely well, they offer a plentiful of details and they stand out in terms of design. 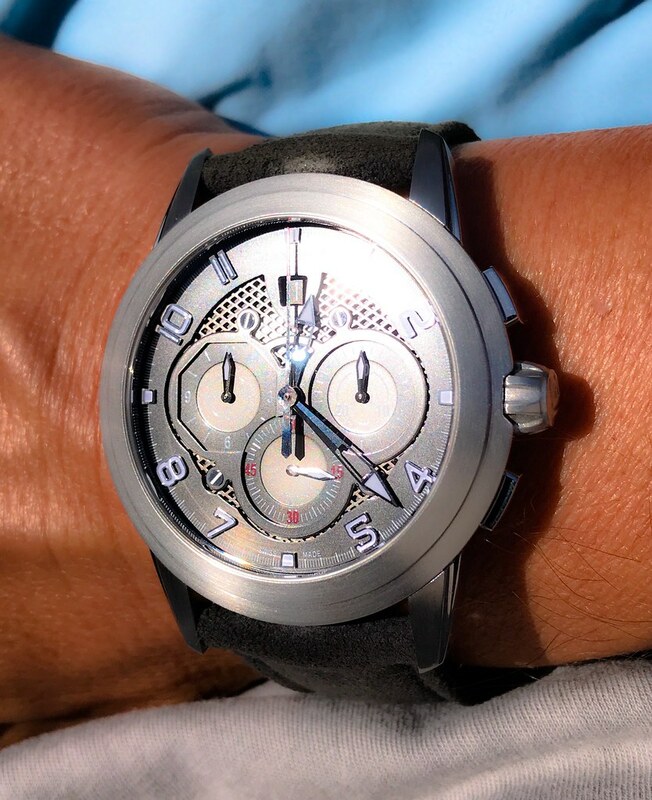 Since the dials are a matter of personal taste it's difficult to give a fair assessment, my personal taste tends more towards the L'Evolution Flyback with the open dial. 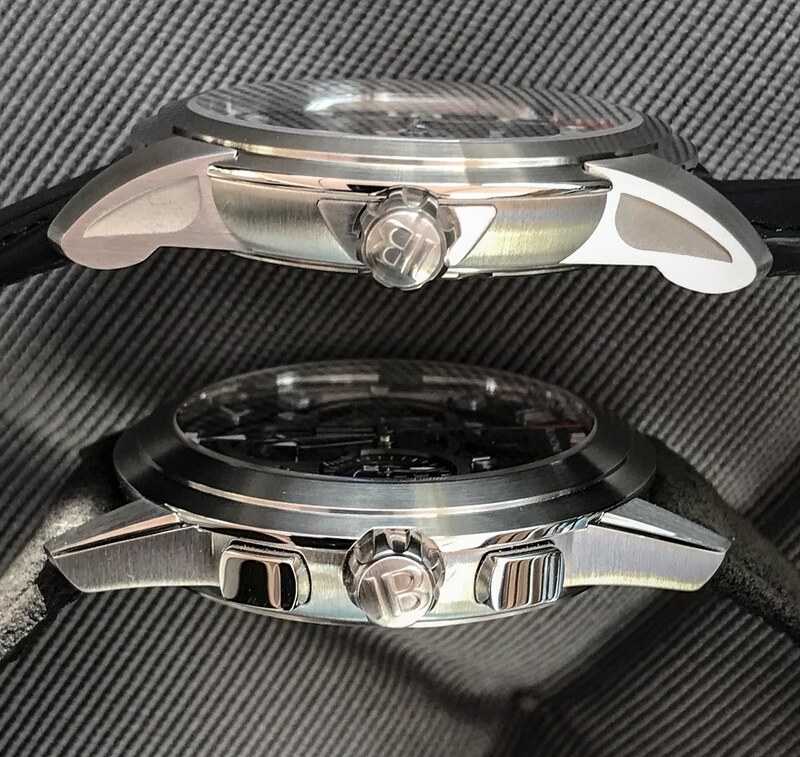 One thing I did not particularly like is the fact that both movements appear too small for the size of the cases, but both calibres are finished well and have distinct elements to support the character of the timepiece. 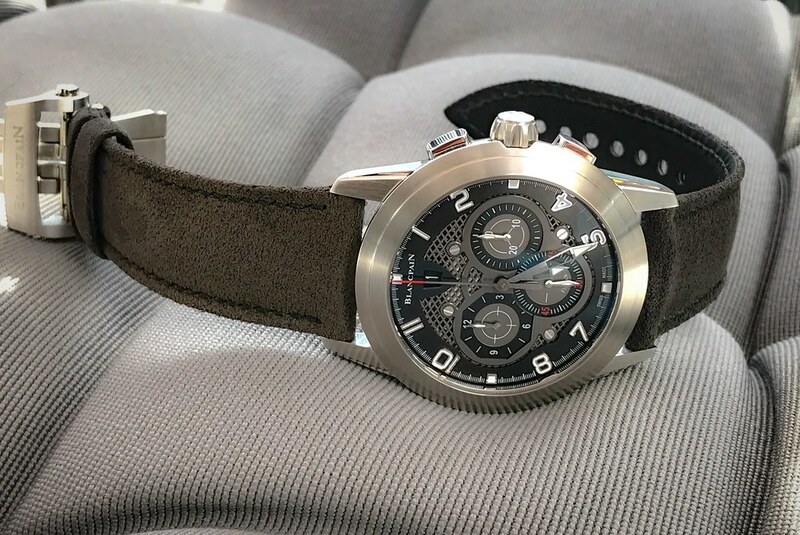 For those with a strong motorsport bias both watches offer a lot, for those who look out for a timeless design the watches may be a bit too extrovert. 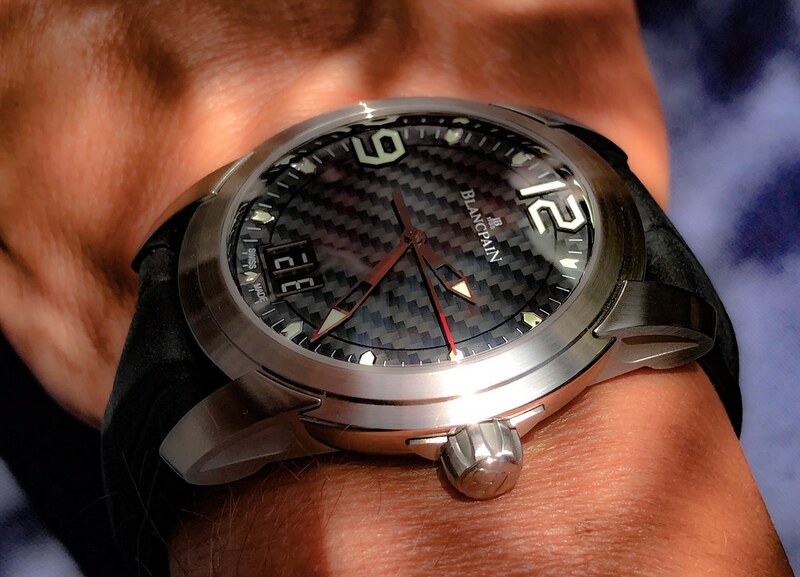 I hope I'll have the chance to get into detail with the L'Evolution GMT Reveil soon and create a report on that piece. 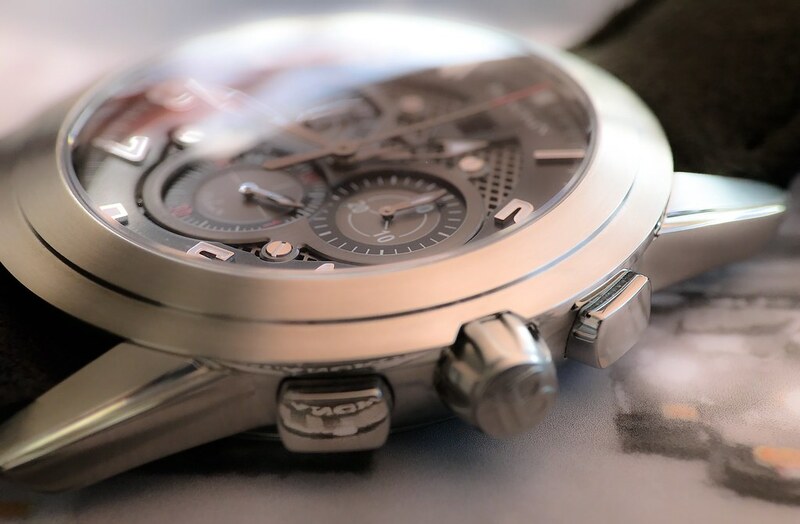 Until then I hope you enjoyed the report and the photographs. 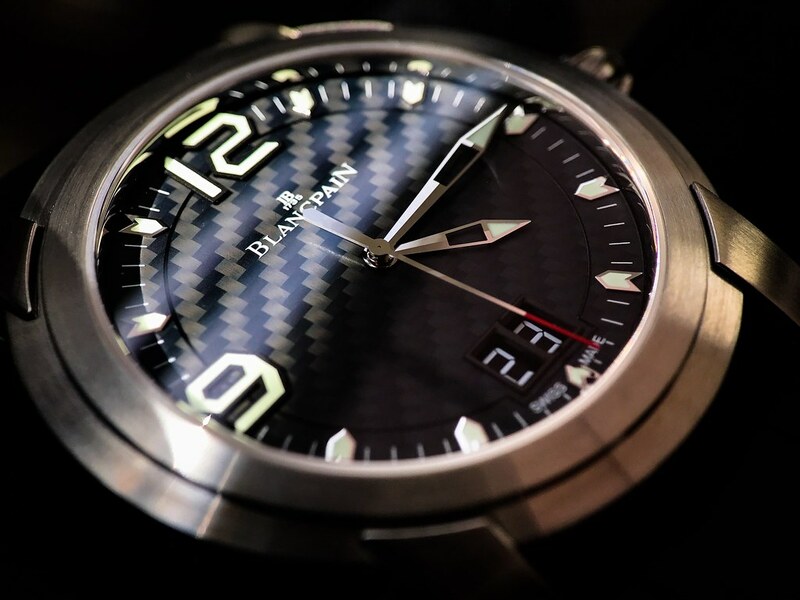 A heartfelt „thank you" goes to the Blancpain Boutique in Munich for giving me the opportunity of the photo session! 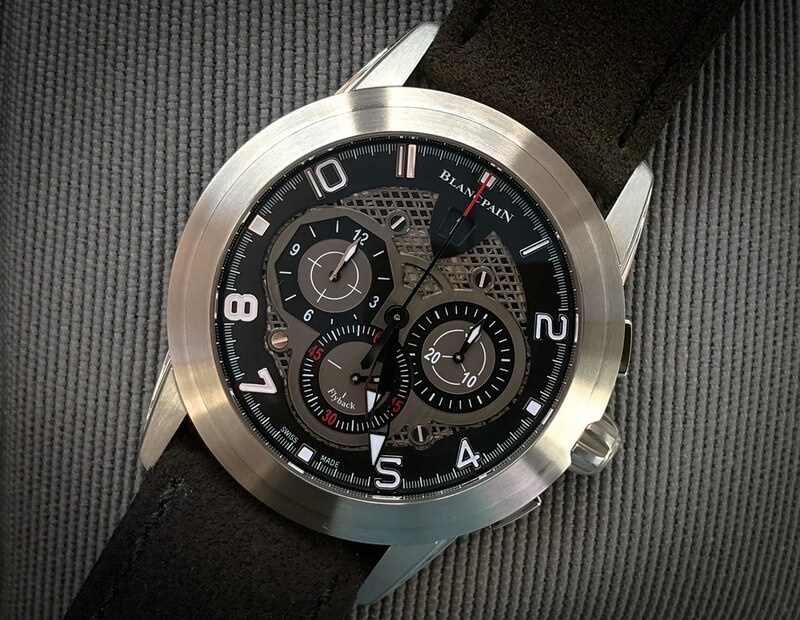 Next Topic: Mil Spec question: True or False?